Technology offers plenty of room for optimization and development, opening up a world of opportunities for IT professionals. In today’s world technology changes very rapidly. It is no longer possible to just self-learn with a busy professional schedule. CloudThat provides Training & Consulting services for your Cloud projects with world class consultants who are industry leaders in architecting & engineering Cloud services with a proven track record. The Company has partnered with Amazon Web Services (AWS), Microsoft, Red Hat, & MongoDB in various competencies, providing Training & Consulting services in technologies like AWS, Microsoft Azure, OpenStack, Chef, etc. CloudThat was founded in 2012, which is the first Indian company to provide Cloud Education along with Consulting. The aim was to provide quality education and consulting for learning Cloud computing, augmenting skills, helping organizations to adapt and leverage Cloud services to enable their Cloud projects. 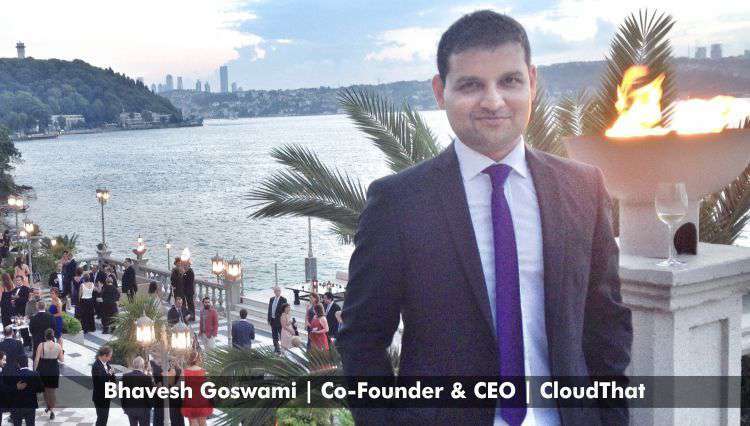 Bhavesh Goswami, Co-founder & CEO of CloudThat was part of the initial development team of Amazon Cloud, called Amazon Web Services (AWS) in Seattle. He helped ship the first version of AWS S3 service in 2006. After over 3 years of experience at Amazon, Bhavesh moved to Microsoft, and accepted a challenge to help manage Cosmos, the Cloud Storage and Big Data computational engine that powers all of Microsoft’s Online Services, including Bing. He has since provided solutions on many different Cloud platforms like AWS, Microsoft Azure, OpenStack, VMware vCloud Air, etc. He is fervent about technology and keeps the company updated with latest Cloud Technologies. Himanshu Mody, Co-founder of CloudThat is an entrepreneur in the IT Education and Consulting segment since 2000. Himanshu has ample experience in developing the vision, strategizing, building and empowering team and cash-flow management. He has implemented his experience in CloudThat for business development and strategies. Bhavesh and Himanshu with extensive years of experience in IT Training and Consulting business, excels in delivering high quality training with best practices. They empower trainees from their Training & Consulting services to gain relevant knowledge and to get certified on respective platforms. CloudThat faced so many challenges in India during establishment; they struggled with weak IP laws, which does not protect the company’s IP. Their course outlines were copied on several other websites without their consent. In Consulting, the local market is still developing. Most of their consulting clients are based out of US and Europe. The Company has developed over 99% satisfaction rating in their trainings with clients from India,US and Europe and are still aiming to develop worldwide. They recently opened up their USA office in Tampa, Florida and UK office in London.